Today everybody wants to know — Who visited my Facebook profile?, Who unfriended me from the Facebook Friend list?, Who saw my Facebook posts?, and many other features that isn't provided by Facebook by default. So most Facebook users try to find out a software and fall victim to one that promises to accomplish their desired task. Hackers make use of this weakness and often design malicious programs in order to victimize broad audience. Following I am going to disclose the realities behind one such software designed cleverly to trick Facebook users to make them believe it is genuine. UnfriendAlert, a free application that notifies you whenever someone removes you from the Facebook friend list, has been found collecting its users' Facebook credentials. 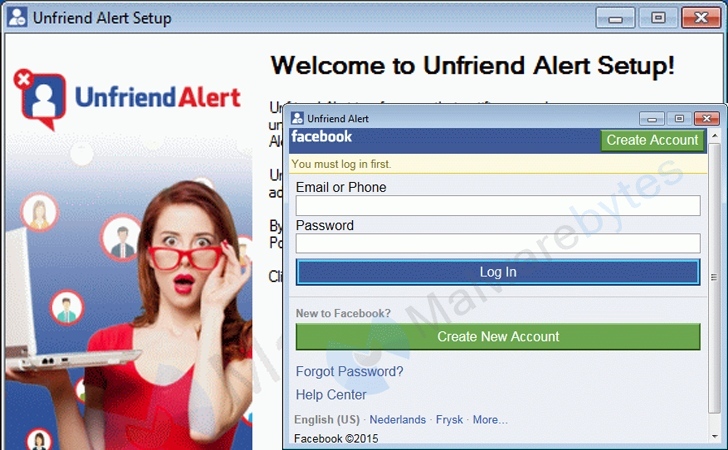 Security researchers at Malwarebytes have warned users of the UnfriendAlert app saying that the notorious app asks users to login with their Facebook credentials to activate unfriends monitoring and alert service for your Facebook profile. Facebook has provided API OAuth login system for third party applications, where users don't need to provide their Facebook credentials to them. So you should never submit your Facebook password to any third party service or desktop software in any case. Once you enter your login credentials, UnfriendAlert will send it to the website "yougotunfriended.com" owned by attackers. Late last month, UnfriendAlert was also classified as potentially unwanted program (PUP) which often displays unwanted advertisements and deceptively installs other malicious software and free apps when visiting some web pages in your Chrome, Firefox, and Internet Explorer, making you fail to block them. Uninstall UnfriendAlert and Change your Password Now! So users are recommended to uninstall UnfriendAlert App from your computer, and besides removing this, you are also advised to change your Facebook password as soon as possible. You can do this under "Settings —> Password —> Edit." Always do some research before installing any third party application as your one single mistake could compromise your online security and privacy in various ways.